Mare not covered this year April 2014. SCHINDLERS HUNT (IRE) (2000 g. by Oscar Schindler (IRE)): 7 wins, £426,000: winner of a N.H. Flat Race, placed twice; also winner over hurdles and placed 4 times inc. 3rd Deloitte Nov. Hurdle, Leopardstown, Gr.1 and 5 wins over fences, 2009 inc. Baileys Arkle Perp. Chall. Cup Chase, Leopardstown, Gr.1, Tatts.Ire. Dan Moore Mem. H. Chase, Fairyhouse, Gr.1, Leopardstown H. Chase, Leopardstown, Gr.1 and Durkan New Homes Nov. Chase, Leopardstown, Gr.1, placed 12 times inc. 2nd Powers Gold Cup Chase, Fairyhouse, Gr.1, Ballymore Properties Drinmore Nov. Chase, Fairyhouse, Gr.1, John Smith's Melling Chase, Aintree, Gr.1, Punchestown Guinness Gold Cup Stp., Punchestown, Gr.1, Newlands Chase, Naas, Gr.2, 3rd Ryanair Festival Trophy Chase, Cheltenham, Gr.1, Hennessy Cognac Gold Cup Chase, Leopardstown, Gr.1, Paddy Power Dial-a-Bet Chase, Leopardstown, Gr.1, 4th Queen Mother Champion Chase, Cheltenham, Gr.1. 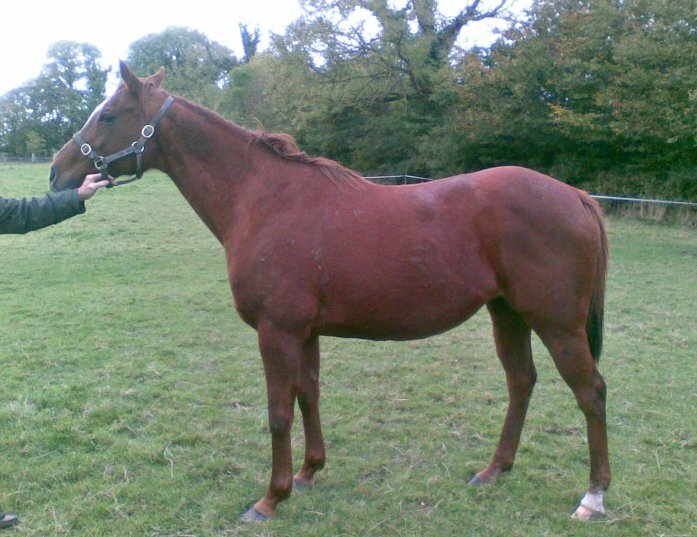 Young Alex (IRE) (1998 g. by Midhish (GB)): 5 wins at 2 to 4 years and £36,994 and placed 24 times. Native Snipe (IRE) (1996 g. by Be My Native (USA)): placed once in a N.H. Flat Race. She also has a 3-y-o colt by Bach (IRE) and a yearling gelding by Definite Article (GB), which realised €22,000 in Tattersalls November N.H. Sale, 2009. AMBERETTA (IND): won Queen Elizabeth II Cup, Calcutta, L.
ALTENBURG (IND): won Herbertson Bagpiper Gold Bangalore Derby, Bangalore, L.
GRAND MADAME (IND): won The Calcutta Oaks, Kolkata, L.
Exotic (IND): winner in India; dam of ALL GAME (IND): 2 wins in India inc. Golconda St Leger, Malakpet, L.
Lantys Luck (IRE): unraced; dam of Barron Watlass (IRE): placed twice in N.H. Flat Races at 5 years, 2009; also 2 wins over hurdles at 6 years, 2010 and £5645. Fivestar Alstars (IRE): winner, 2008 and £10,770; also 3 wins over hurdles, 2009 and £29,468 and 2 wins over fences, 2008 and £21,816. Tudor Heather: 2nd Chesters S., Newcastle; dam of 2 winners. DOUCET (BRZ): won C. Jockey Club do Rio Grande do Sul, Gavea, L.